Yesterday I presented the estimated Android income statement vis-à-vis Apple’s income statement. In this post I’ll compare Android as a part of Google’s overall business. Recall that Google has already been compared in terms of overall revenue, growth and profitability to Apple and Microsoft here. The argument can be made that mobility has not yet had a measurable impact on Google (certainly not noteworthy enough to be reported by management). I used color coding to identify non-Android (Green) and Android (Brown) segments of the business. Overall, Android could amount to about 3.5% of total Google revenues and about 5% of operating earnings. It’s important to note that this is not all the revenue that Google obtains from mobility. This diagram represents Android only and there are revenues also coming from alternative platforms and operator deals. iOS contributes between 3 and 5 times more ad revenue to Google than Android. The contribution to earnings is even more difficult to assess. We don’t know the terms between Google and Apple for search revenue sharing and placement. One analyst suggests that the cost of sales (TAC) for mobile Safari search could be as high as 60%, far above what Android traffic costs. 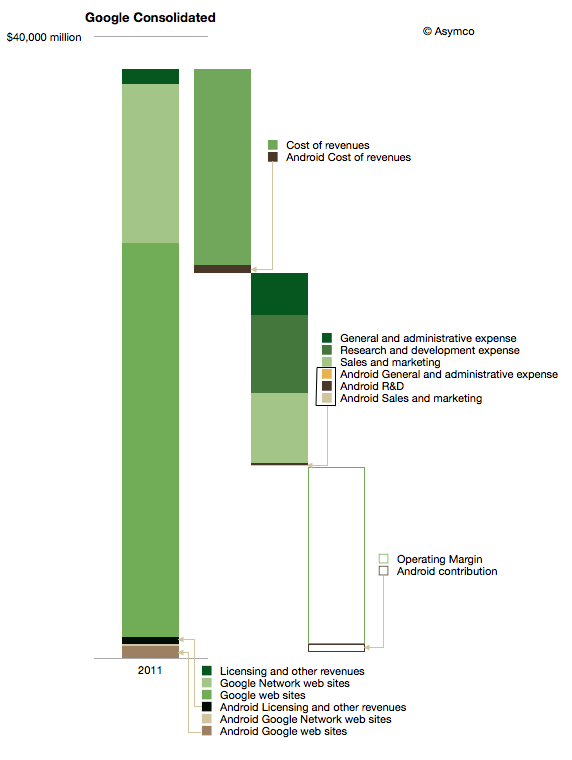 The other observation is that Android cost structure is quite small (see third bar from the left above.) My estimate is that Android R&D is only about 3% of total Google R&D. I’m projecting $200 million for 2012. That implies between 700 and 900 headcount. It’s interesting to compare that total to the 20,000 or more that came with the Motorola acquisition. Having these estimates allows one to calculate many ratios and potential valuations. I’ll refrain from putting a value on Android using multiples or sales or earnings, but would come out well below what was paid for Motorola’s $12.5 billion. Which again compels one to ask what is the strategy at work here. There are various reports of the ratio including congressional testimony and reports to courts. BlackBerry, Docomo and KDDI were listed as significant other sources of ad revenue by Google in 2010.